The presentation will be an opportunity to experience Visual Thinking Strategies (VTS). VTS is used in educational institutions and fine art museums internationally. This method was developed in collaboration between the NY MoMA and Developmental Psychologist Abigail Housen. The VTS experience will engage viewers with visual art directly, developing their own meaning making abilities and observation skills. Participants will engage using personal strategies for looking at visual art through a constructive process based on research. Participants will gain confidence and skill for using their own eyes and voices to generate meaning of a piece of art. 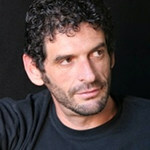 Oren Slozberg is the Chief Strategies Officer and EDGE Program Director at Commonweal in Bolinas, CA. He has been a senior program developer in the fields of education and the arts. Slozberg co-founded the MMG Foundation, dedicated to Visual Thinking Strategies (VTS) in California public schools. In May 2006, he became Executive Director of Visual Understanding in Education (VUE), the national organization that implements VTS in the United States and abroad, reaching over 250 museums and 75,000 students Slozberg is a senior trainer in VTS who has led over 60 VTS trainings. As Director of the EDGE program at Commonweal, Slozberg is exploring the developing of group intelligence through engagement with the arts.